An 80s-like game with complete documentation and refined source code. "Your God asks for blood !" - "My God asks for cubes." As the Divine Warrior, your mission is to slain all the Cubes of Evil in the Dark Land Of No Return. But is there an end to evil? 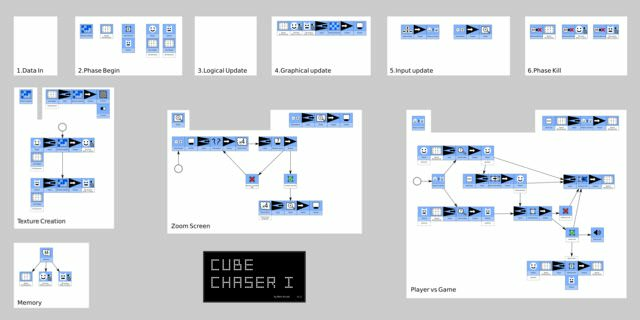 Cube Chaser is a series of games made with as few resources as possible, and slowly evolving between each release (a kind of Evoland-like project). Inspiration for the story starts from Chakan: The Forever Man (mostly the comics) and its perpetual fight against evil, and will slowly evolve towards Actraiser 1 and its link between Man, God, technology and social progress. The games themselves are action-RPG, whose main inspiration is the Quintet Trilogy (Soul Blazer, Illusion of Gaia and Terranigma). If you don't know those games, think about Zelda with less items and more soul. And the source code has been particularly refined to be readable, commented, and easy to modify with less than 10 lines per function (full C#, pure Visual Studio). Hey, thanks Wur. If you reach Chapter 3, I would be interested to know what you think about the change of gameplay.